Nestling in the front of the Holiday Inn on Beach Road is a sleeper of a bar/restaurant named Havana, complete with photographs of Fidel Castro and Che Guevara on the walls. I say ‘sleeper’ because it is on Beach Road, one of Pattaya’s busiest thoroughfares, yet it is hidden because it is behind the Holiday Inn’s Terrazzo restaurant. However, it is really not difficult to find, now that you know! Parking on Beach Road can be difficult, but it is easier and safer to use the Holiday Inn’s secure car parking behind the hotel, and after the gateman lets you through, at least you know there’s no bombs under your vehicle! The Havana Bar is very large, with enormously high ceilings and ornate wrought iron lamps suspended from it. The table settings are an eclectic mix, some obviously for those who like to settle back with a drink or three and others more utilitarian for those there to eat. Our host for the evening was the charming Panida Ottesen, who described the décor as ‘retro-Cuban’, and that probably describes it best. Before perusing the menu, we ordered a bottle of the Stonefish Cabernet Sauvignon, which at around B. 1,400 is excellent drinking. It is available at B. 260 a glass, but one glass of this wine is definitely not enough! The menu starts with Traditional Pizzas (B. 300-390) with all the usual styles on a thin and crispy base (as pizzas should be). There are also some ‘Signature’ pizzas (B. 390) including a tom yam goong version, a Greek version and an Indian example. 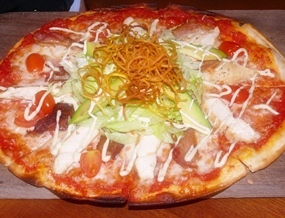 You can also create your own pizza with up to five toppings (B. 350). Pastas are well represented (B. 250-350), and the Thai menu has been upgraded and enlarged, as the Havana Bar has become a favored place for the Bangkok Thai contingent at weekends, with most dishes B. 275. By the way, the menu also has indicators for vegetarian dishes, spicy dishes and those recommended by the chef, plus the prices quoted are net, as they already include a 10 percent service charge and a 7 percent VAT. The menu continues with Snacks and Bar Bites, all generally around B. 200 and includes baguettes, chicken wings, quesadillas and spare ribs. From there it is into Antipasti and Salads (B. 175-320) with an interesting mango caprese salad as well as the usual Parma ham and melon. Soups are B. 175 and you have the choice of minestrone or roasted red peppers and tomatoes. Burgers (served with fat chips and salad) are generally B. 285 and that includes the ‘All-American’ burger with 200 gm of 100 percent beef pattie, followed by Mains also ‘mainly’ B. 285 with lamb, beef, salmon, chicken and pork. We sampled both soups, and they were very filling and then a Hip Club pizza for Madame and the marinated pork loin for myself. All our choices were very pleasant. 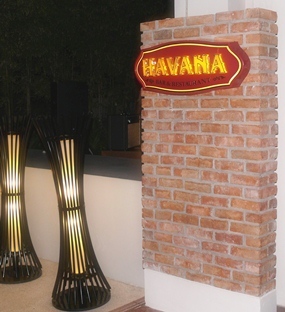 The motto of the Havana Bar is ‘sapore delizioso’ which just means ‘delicious taste’ and we would agree that Havana did give us that. We finished our review drinking the Havana Bar’s signature drink, the Mojito (similar to a caiparinya), a very drinkable and refreshing rum based tipple, while listening to the live music (Friday and Saturday nights). 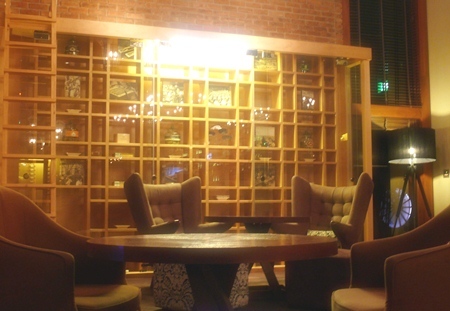 Havana Bar offers a good range of bistro-style dishes, with very large servings and well presented. In fact, I was unable to finish my main course because it was so enormous, and the pizzas are definitely meant for two to share. Madame couldn’t manage desserts! Havana Bar (in front of Holiday Inn and behind Terrazzo restaurant), 463/68, Moo 9, Pattaya Beach Road, tel: 03872 5555, fax: 03872 5562, website www.holidayinn.com/pattaya. Open 2 p.m. till 1 a.m. Monday to Thursday and 12 noon till 1 a.m. Friday, Saturday, Sunday. Secure parking behind and underneath Holiday Inn. Previous articleAlois Wine Dinner – no April Fool!